Have you ever been accused of being a surface looker? Have you ever walked through a room a half a dozen times looking for your car keys only to have your spouse or child walk in and locate them on the first pass through? This can be a frustrating occurrence, one that is normally followed by a certain amount of chastising or ribbing from the one who found your “lost” keys or wallet! Locating the source of a roof leak in your roof system can be just as challenging and daunting as locating your allusive set of car keys or wallet. Roof leaks can be difficult to locate and can often be contributed to by more than one source. The actual source of roof leaks can elude even the most experienced roofing professional. Roof slope, surfacing and the type of roof deck among other factors can all contribute to disguising the actual source of a roof leak. Roofing professionals including contractors and roof consultants utilize many different tools to solve hard to find roof leaks. One of these tools that contractors and consultants use and which is available to homeowners and building owners is infrared technology. Infrared technology allows individuals looking for the source of roof leaks to be able to look through the surface of their roof to reveal potential leak sources and trapped moisture within roof assemblies. It allows you to see the roof assembly through a different filter that can reveal potential problems and sources for that elusive leak. The science of infrared scanning and technology behind it can be complex to understand. Simply put, infrared scanning is the practice of using infrared equipment to measure the heat being emitted from the surface of an object. The patterns being emitted from the surface of an object are measured and captured by infrared cameras which form the data being collected into images. These images can then be analyzed by a trained professional to determine if there are areas which are anomalies. Anomalies may indicate areas that require further review. Infrared scans are most often done during the early evening hours after the sun has begun to set. In order for an infrared scan to be completed, the roof surface must be dry as moisture interferes with the camera’s ability to measure surface temperatures. It is also preferable that the surface of the roof system receive exposure to substantial sunlight to allow the surface of the roof system to heat up as much as possible. This heat absorption allows the moisture trapped in the roof system to increase in temperature and create a temperature difference that can be measured by the camera. How is Infrared used to locate a Roof Leak? Leak investigation is not an exact science. Most professional contractors would agree that it is, in fact, more of an art form. And if most contractors are honest, they will admit that there have been leaks that have been difficult if not impossible to solve. Many of these hard to solve leak issues have been resolved through the use of infrared scanning and technology. As a roof leaks, moisture penetrates through the surface of the roof system and begins to saturate the underlayment or decking for the roof system. After the underlayment or decking is saturated and can no longer absorb any additional moisture, the water begins to leak into the inside of the building. This source of moisture and the saturation below the surface of the roof system is what begins to absorb the sun’s heat. As the surface of the roof system and the underlayment or decking begin to heat up during the daytime hours, the moisture that is trapped in the roof system begins to heat up as well. As the late afternoon and early evening approaches the heating effect of the sun begins to slow and stop. As this occurs, the roof assembly begins to cool off. The moisture-laden materials below the roof surface retain heat longer than the areas of dry underlayment and decking. This temperature differential between areas of wet underlayment and dry underlayment is what the infrared technician is looking for in order to locate the source of roof leaks. Once areas are located that are showing as potential sources of leaks or trapped moisture, the infrared technician marks those areas with spray paint or other form of marking. These areas are outlined to allow for quick location during daylight hours. Upon returning to the roof during daylight hours, further analysis is conducted by the roofing contractor and infrared technician to determine the source of the moisture in that area. If necessary, a non-penetrating moisture meter can be used to confirm the presence of trapped moisture in the roof assembly. In addition, the roof may be disassembled in that area in order to physically test the roof assembly for moisture. What Equipment and Material is needed? Leak investigation is not an exact science. There are times where locating a leak source and correcting the problem is a process of elimination. Utilizing infrared scanning as a tool to locate a hard to solve roof leak may assist a homeowner or professional contractor in resolving a difficult leak condition. 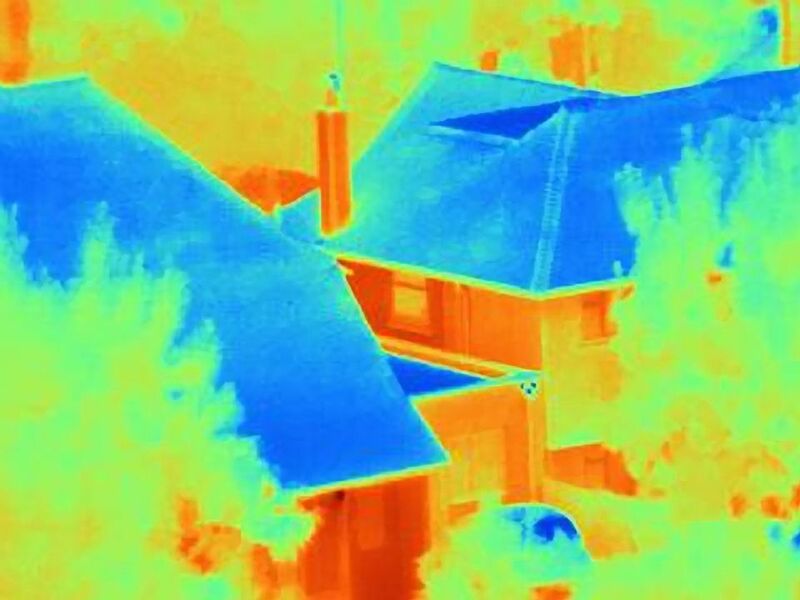 Infrared scanning may reveal issues that are hiding just beneath the surface and help the homeowner or building owner in resolving their issues and prevent any further interior damage to their structure.